How to organise successful events course: On line events course. Do you run or are thinking of running events? Do you want to know the ‘how to’ of creating and producing great events? Have been given an event to run and don’t know where to start? Do you run events and want to get a better return on your time, effort and money investment? Events play an ever-increasing and important part of our everyday lives. We love our events! They can encompass anything from festivals and conferences to food and craft fairs to parties and celebrations. Events are also a tried and tested method for businesses and organisations to market themselves and generate sales. However, creating memorable and crucially rewarding events when visitor expectations are so high – is no easy task. Events however, like many things in life, seem in essence quite simple things but are in fact, a little more difficult to actually deliver. Designing, planning and producing events is a bit like directing a live stage show. Unlike a show though: there is usually no dress rehearsal or full run through and once started – no second chances. Now here’s the BUT. My experiences have shown me that we can all be great event managers, with a little of the right kind of help and a ‘can do’ attitude. So on my online event planning course – How to organise successful events, I am going to teach you everything I know about the ‘how to’ of organising great events and so give you the skills and confidence to run your OWN events…in just a few hours. And of course. . . know that YOU can design and deliver successful and rewarding events: packed full of great takeaway memories. The Event Expert ‘How to organise successful events’ is a high content course designed to give you a good understanding of how to run successful events. You will get clear, logical, easy to follow advice that you can implement straight away. Access to my unique 7-step event planning process. NB: It’s the same one I use to run my own events. I have been designing, planning and delivering events for the past 20+ years. I know events are no soft option. However with the right kind of help and a positive attitude, I believe we can all be great event managers. This course will certainly set you up nicely to enter the wonderful world of events planning! Incidentally I knew nothing about events when I was asked to run my first event. I learnt quickly and happily survived. I think you will too. Who is my How to organise successful events course for? New event managers who have no or little actual events experience or formal training. Anybody who has been given an event to organise or been asked to help plan and deliver an event. Anybody who has tried events before but found they have not quite delivered. So if you are an employee or are doing this voluntarily for a charity, community group, club, association, school, college or interest group this course will give you a full understanding of the ‘how to’ of successful event planning. It is suitable for all types of public and business events. It is not suitable for experienced event planners but, would be a very helpful reminder of the fundamentals of successful event planning or for those who have had no formal event management training. I would recommend you set aside about 8 hours (a day) to review the presentations, watch the videos, read the accompanying blogs and reference manual and complete the quizzes and exercises. An extremely helpful events course. I found the course extremely helpful. I have learnt things I never knew before. The workbook provided during the course is great for taking notes and the reference manual is full of so much useful information about everything you need to know. I have kept a copy of both for myself to refer back to when I need a bit of guidance. I really liked the fun test at the end of the course to the quiz after module 8. I fully enjoyed the blog posts, I especially liked reading about Chris's own personal experiences. I particularly liked the blog titled ' is finding the perfect venue really such a big deal'. I believe reading about his personal experiences as an event manager really helps understand all aspects in organising an event. I will recommend the course to anyone who is truly interested in the events industry. “Knowing the considerable knowledge and experience that Chris has of the events industry left me in no doubt about his suitability to run a training workshop session on event management. The day was perfectly balanced and extremely informative. Chris maintained our interest and attention throughout, even though some of us have spent many years in event management. If you, or your organisation, are involved in special events then Chris is definitely worth talking to: if you invite Chris to run a similar session it will be an investment worth making”. Thank you so much for running the course Chris. Everyone said it was incredibly useful and interesting. I think it's opened their eyes to a lot of things so well done on putting together something so relevant. “I have attended two of Chris's courses, Organising Successful Major Events and Festivals and Organising Successful Community Events. I am relatively new to the events industry and found both of these courses very informative, relevant and useful to the work that I am doing”. “Chris is an excellent tutor. His experience, coupled with his delivery style, made the training courses I attended a very entertaining but informative way of developing the skills required to deliver successful events." Creative, personable, expert, very keen attention to detail, enthusiast, inspiring, passionate, engaging, funny, relaxed, captivating, knowledgeable, meticulous, real can do approach, really really…knows events, practical, excellent communicator, approachable, has a wealth of event experience and likes coffee! This course with a score of 81% has been independently accessed and has been given a 'GREAT' badge of approval. 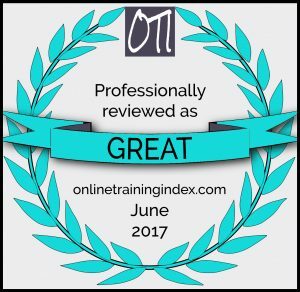 Click on the badge to find out more about the On Line Training Index. Do I need to have run events before to go on the course? No you don’t. But an interest in events and a love of attending them is a must! NB: This course is hosted on Canadian On-line learning platform Thinkific - prices are therefore in dollars and UK pounds for easy conversion. Now if that wasn't already a tempting price here's over $600 (£500) worth of bonuses you will also receive FREE as part of course fee. If you are not entirely satisfied with the course: I offer a 100% money back guarantee for a period of 30 days after you purchased the course. I really do believe that you will find the course incredibly helpful as you seek to learn the event planning ropes but should you not: I will give you your money back. No questions asked. PS: Imagine having the confidence to run your own events? To lead or be part of an event planning team organising charity, arts and sports events: exhibitions, shows and fares, parties and celebrations and know you did yourself…with a little help from someone who started…just where you did – knowing nothing about events! Go on: give it a go: you just might have a talent for it? It could be your thing?